But it wasn't until I was sprucing up my studio (tour coming soon!) 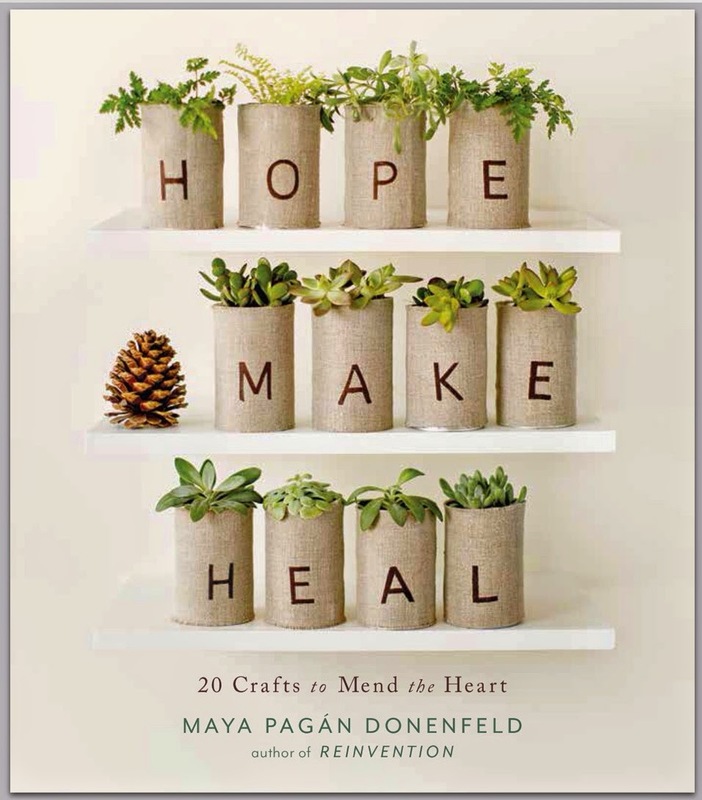 that I remembered Resurrection Fern's hoop doilies. (Margie really is the doily/crochet queen!) It was so simple and obvious... my favorite kind of making. I got so excited that I stayed up way too late gently tugging and pulling to get the pattern just right in my quilting and embroidery hoops. I used double sided tape all around the inside of the hoops to keep the loose ends controlled, but still in tact. I'm really pleased to have this lovely handwork, steeped in history and tradition, above my sewing table. I'm also happy that, at least, four little doilies finally get to come out of the their hiding spot to be honored and celebrated. Do you have a favorite collectible? p.s. dare you to say "dear doily" 5 times fast! 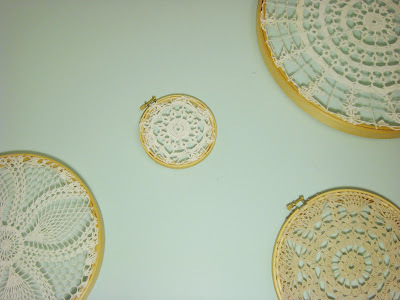 I am working on some embroidery hoops to put up as a collection, maybe I will throw a doily in the mix- they look great! 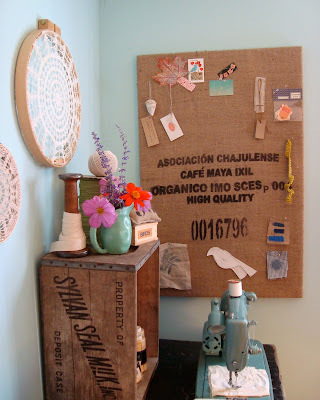 I love your pin board made out of an old sack...brilliant! I would love to have such a beautiful collection of Doilies, such a wounder display and lovely craft room to work in and be inspired by. Hi Maya, I'm a long time reader, but (not so often commenter! ).I have long been a doily fan also - and have amassed quite a collection. I like how you have displayed yours. I recently made some cushion covers with mine (http://www.flickr.com/photos/linaloo/3769939308/)and will be adding some to a skirt I'm currently making. There's also a great Martha tutorial on using starch to make a winter snowflake display with them! Beautiful! It makes me want to frame my grandmother's crocheted table topper. Big? Yes. But, it would look lovely in my liveing room! I adore doilies and I have collected a lot. However being that I'm 22 I don't think that using them as table liners really suits my style (not to mention my husband is not a fan of them). I'm glad to see more ideas to use them. I just found a few palm sized ones, so I think I'm going to make a headband! Wow...gorgeous. I love this take on the whole fabric covered embroidery hoop trend. Your sewing area looks amazing! A few years ago I had several of my grandmothers doilies framed for each of my childre. I have one on either side of my fireplace. Grandma was never with out the crochet hook flying along in her hands. 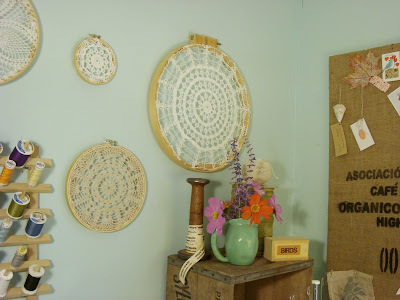 Maybe I will do a few more on the embroidery hoops for my craft room too. I LOVE this! How clever and so simple. I am definitely going to do this with all the doilies I have stashed away. Thanks so much for sharing. So beautiful! I was just wondering last night what to do with all my extra doilies, and this is perfect! All I need now is more wall space...darn! It really looks lovely. I can't wait to see the tour of your studio. From what I can see in these pictures it is going to be amazing. I just had to read the apartment therapy comments about the doilie trend fearing the worst. It seems about 50:50 love it or hate it. How could anyone hate a piece of hand made art that some mother or grandmother so lovingly created. okay, yes a must try. Can't wait for the tour. How exciting. Your display is great and the pinboard is so nice and so you. Cannot wait to see more pictures of your studio !! 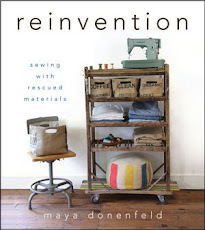 Dear Maya, the idea is wonderful. I really liked and I must try it! You have a great style and that spot is gorgeous! Btw, I have a new blog. I collect those asian lucky cats. You know the ones that are always in restaurants? I also collect tiny chairs and E.T. memorabilia. I don't exactly collect owl things, but I do have a lot of them. I'm a thrift store junkie. I am not really sure if best practices have emerged around things like that, but I am sure that your great job is clearly identifed. I was wondering if you offer any subscription to your RSS feeds as I would be very interested and can't find any link to subscribe here Please come visit my site Internet Business Directory of Aurora City when you got time. Thanks. I am not really sure if best practices have emerged around things like that, but I am sure that your great job is clearly identifed. I was wondering if you offer any subscription to your RSS feeds as I would be very interested and can't find any link to subscribe here Please come visit my site Internet Business Directory of Louisville City when you got time. Thanks.